Patrick Dermak, co-founder of Cologne-based performance marketing agency Adbaker. The award-winning agency generates thousands of leads and sales in Europe and North America via Facebook & Instagram every month, and is deeply rooted in the CPA & affiliate industry. Counting international corporations like Porsche & Kingston Technology as well as innovative startups & private equity firms among their clients, Adbaker is also deeply rooted in the CPA & affiliate industry. Moreover, Patrick is a guest lecturer at the Executive School of Management, Technology and Law at the University of St. Gallen, Switzerland. If you want to step up your Facebook game, don’t miss his presentation on 'Top 10 Facebook Hacks'. Hans Affolter, International Business Development Manager of Twispay. Hans’ expertise as a Swiss Banking Specialist in the financial industry lead him to support his friend in building up a Romanian FinTech start-up. Thus, Hans took on the mission of driving the international development of Twispay. Hans' compelling presentation is particularly valuable for our attendees running or planning an eCommerce business: 'The 3-Step Guide to Low Chargeback Ratios'. Fabian Rossbacher, owner of Barf-Glück and SEO Day. 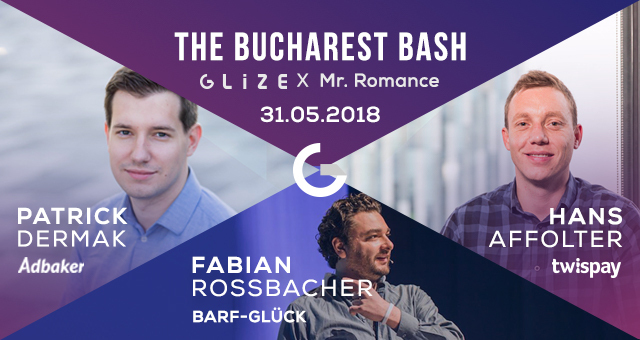 Founder of one of the largest SEO conferences in German-speaking countries with over 45 speakers, 900 guests, 200 media partners and top industry sponsors, he will share from his experience as head of performance, and the challenges of applying key skills to a brand new venture, Barf-Gluck. As he has achieved some of his best performance with the help of chat bots and lead ads, he is ready to impart his knowledge with us. Feel free to connect with the guys during the Networking Evening from 7pm, meet your old industry friends and make new contacts. Buffet & Open Bar on us! From 10pm onwars access in Nuba will be open, so let's party with the beautiful people and make it a night to remember! Register Online to confirm attendance and stay updated on our Event Page for further details.